On same day of my birthday lunch last week, I first noticed the The Turkish Grill as Thea, Camille and I were approaching Yum Yum Queens on the next block over. An advertisement about their $9.95 lunch special outside the door seemed intriguing to me at the time. “Next week, I’ll check it out,” I told myself. Today, I need to wander about. And eating some Turkish food sounds perfect on a day like today. I ordered the Hummus to start, which had a delicate garlic aftertaste, very pleasant, and was garnished with a single slice of tomato and one black olive. The bread was twisted white rolls. 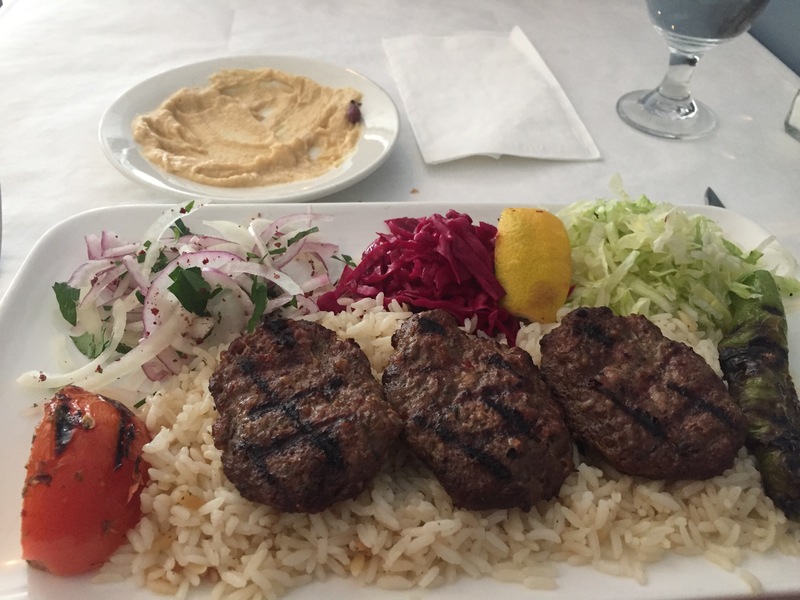 My lunch entrée was the Kofte Kabab (flattened lamb meatballs flavored with onion and parsley) with grilled tomato and green peppers, and side garnishes (chopped red and white onion and parsley, red cabbage, lettuce and a slice of lemon) on a bed of rice. The lamb was grilled nicely with a good texture, its taste was excellent. The rice was perfectly made. I usually don’t care that much about rice when it’s not the mainstay of the plate, but this time I was pleasantly surprised; the char from the vegetables/meat mixed into the grains, making it even better. The vegetables were great as well. My favorites were the grilled tomatoes. It was a very satisfying lunch. Since tonight’s the first choir rehearsal for the Spring semester, it will keep me going for many hours, hopefully!